For every situation you encounter, remember to simply act with love. Sani Chen thought she knew where life would take her. She always felt a deep and personal connection with God and when a chance to achieve her lifelong dream (to become a nun) – she jumped for it. Only…when she was training to become a nun in Taiwan…she reached the dreaded realization that all her hopes and dreams were never going to come to fruition. I had just been informed that I would not be accepted into the nunnery…my spirit fell with despair. So she returned to America to be with her family, and along the way realized that there was a certain something she took a little bit for granted in her haste to become a nun. 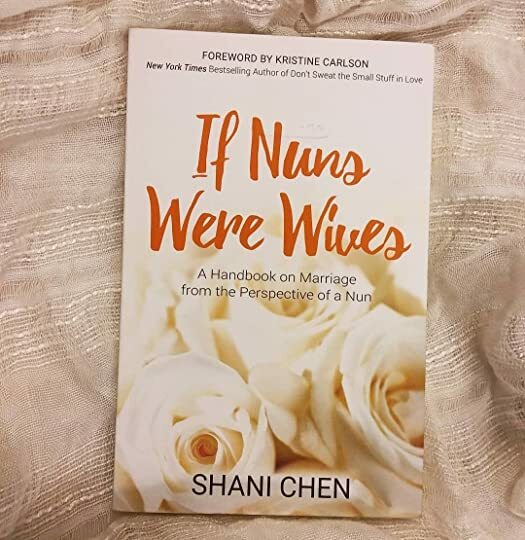 And soon Shani was married and navigating a whole new world…one of which seemed to have quite a bit of overlap with her previous months spent trying to become a nun. To address a colossal problem, you need a colossal solution. And in this case, the nuns are finally worthy contenders for that which dissolves sacred unions. In this book, Chen dispenses knowledge and advice learned from her time surrounded by nuns. In short – what a quick, fun read. She uses events or moments over the course of her marriage that she noticed overlapped with her previous life as a would-be nun. I enjoyed how Chen provides quite a different perspectivefrom the typical marriage-advice book. …we should not fight every battle. and others really made me think about my actions and the consequences. ..every intentional smile is an act of kindness and no act of kindness is ever wasted. It always makes a difference to someone, somehow. When I’m out, I try not to let my eyes wander when it comes to looking at other men. Does this mean she’s careful not to check out men in the presence of her husband (reasonable), or does it mean she literally refuses to look towards other men (a little less reasonable)? I do wish this novel was longer. Quite often she would intersperse moments of her own lifethat parallel the religious point she would make, but those interludes came and went so quickly that I had a hard time following the overall storyline. It was Saturday, a night where everyone was probably out there doing something fun and exciting. But I was having a bad night. In fact, I was having a night where I felt like killing myself. but doesn’t go into detail regarding how or why these feelings came up. I think that if that was expanded upon, that would have been a very powerful moment, but as it is written, I had more of a wow-where-did-that-come-from reaction. Overall – I did enjoy this novel and there are several kernels of wisdom that I will be definitely taking to heart!